El Oasis Events, Retreats, & Weddings in Sayulita is a residential estate with 5 individual casas that share a stunning common area with spectacular views. 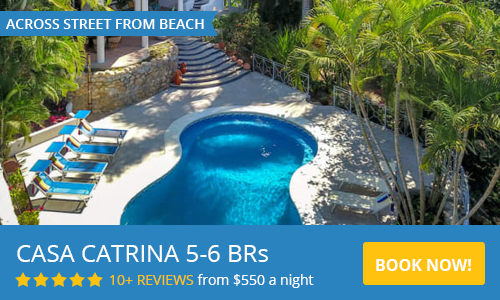 The entire property can be rented for extended family vacations, wedding groups, or retreats, providing a total of 10 bedrooms, accommodating 24-34 guests. The casas available for rent at El Oasis include Casa Campana - a luxury 4 bedroom casa, Casa Sirena - a two bedroom casa, Casa Sandia - a one bedroom casa, Casa Pajaro, and Casa Luna - family style one bedrooms, and Casa Estrella, a honeymoon luxury one bedroom with amazing 360 views. The common area is breathtaking, combining luxury comforts with impressive views of the jungle and mountains. The bi-level waterfall pool is saltwater filtered and easy on the eyes. Relax in the shallow end hammocks (yes, in the water! ), jump off the waterfall into the deep end, sit in the shady cave with views of monkey mountain. Chat with friends in the huge palapa lounge and bar area, or bbq some dinner to share in the poolside sunken dining area. A garden completes the scene with banana, lime, and avocado trees. The expansive area combines private nooks and social space in the perfect balance. Please contact us via the form with any questions and to arrange your special event in Sayulita. For the last 10 years we have lived on site with our 3 school age girls and can offer local advice, maps, and can even arrange concierge services for your activities, cooking, in house massage, childcare and other needs. We look forward to welcoming you to El Oasis in Sayultia!